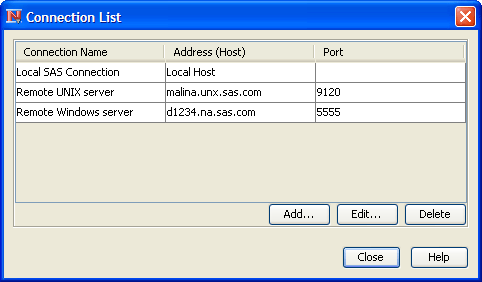 Connections to SAS servers are defined in the Preferences window. To access the Preferences window, select Tools Preferences on the menu bar. 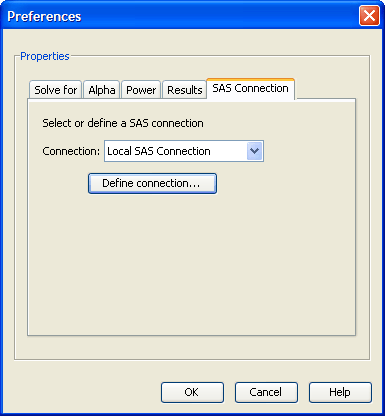 Click the SAS Connection tab to select or define a connection to a SAS server. A connection to a SAS server is required in order to calculate results. The server can be on your local (desktop) machine or on a remote machine. You can define several SAS connections and choose the one you want to use. To select a previously defined connection, choose it from the Connection list on the SAS Connection tab; see Figure 71.19. To define a SAS connection, click the Define connection button. The Connection List window appears, as shown in Figure 71.20. To create a new connection, click Add. To edit an existing connection, select it in the Connection List and click Edit. After you click the Add or Edit button, the Define SAS Connection window appears, as shown in Figure 71.21. If you clicked Edit, the previously defined information is available for editing. Enter a descriptive label for the connection. The label is used to distinguish among the connections in the connections list. Then, select Yes or No to specify whether the SAS connection is to the local machine (that is, the one on which PSS is running) or to a remote machine, respectively. To define a connection to the local machine, enter the full path name of (or browse for) the SAS executable file (sas.exe on Microsoft Windows). Test the SAS connection by clicking the Test SAS Connection button. To define a connection to a remote machine, select either the UNIX or Windows option to indicate that the remote SAS server is on a machine running the UNIX or Microsoft Windows operating systems, respectively. Then, specify the machine name and port number that the SAS/Connect spawner is using on the remote machine. Contact the SAS server administrator for this information. If the remote machine is running Microsoft Windows, select the User id and password are required if authentication is required to access the SAS server (that is, if the SAS -security option is used). 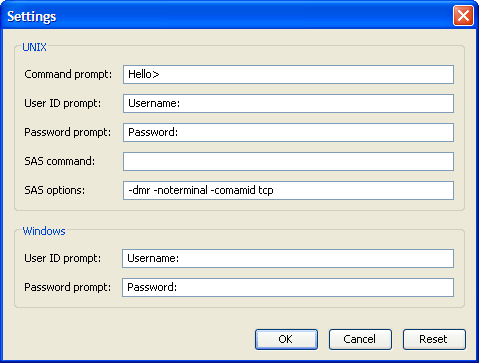 By default, authentication is required for SAS servers running on UNIX operating systems. 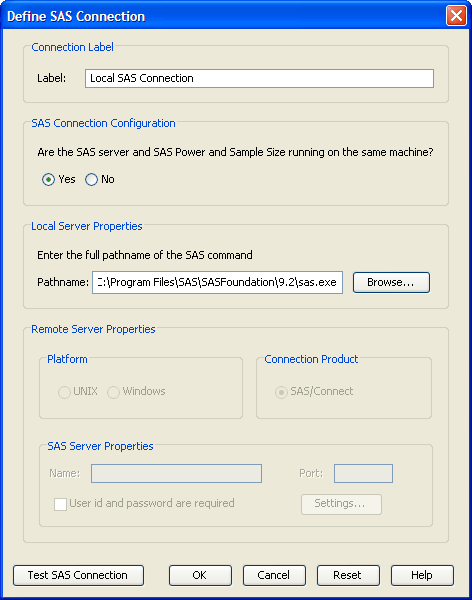 Click the Settings button on the Define SAS Connection window to access some additional settings for a remote connection to a SAS server. For the most part these settings are prompts that PSS expects to receive from the SAS/CONNECT spawner on the remote machine, as shown in Figure 71.22. If the remote SAS server is on a UNIX machine, you must specify the full pathname of the SAS command. Contact the SAS server administrator for this information.